Female protagonists are now in the spotlight if E3 2015 was any indication. From what we’ve seen of Mirror’s Edge Catalyst, Keiji Inafune’s ReCore, Guerilla Games’s Horizon: Zero Dawn, Fallout 4’s customizable character, Evie Frye in “This year’s Assassin’s Creed”, and Emily Caldwin from Dishonoured 2 it feels like the industry has realized that video games are seriously lacking in strong female protagonists. This year’s mix of games definitely brings more females into the spotlight than ever before, but some fear that developers are just placating players while not seriously considering what it means to have a woman in a game. You could say I still have a little “Faith” in developers. I think developers have seen the need for more women in games, yes, but a video game character is not just defined by their gender. They are defined by the actions they take and the decisions they make. And from what I’ve seen, the characters that premiered this year are definitely are not lacking in the action department. Aloy is a hunter and explorer about to undertake a huge adventure. Horizon: Zero Dawn, for me, is probably the game that I’m most excited for out of the bunch. Aloy is a hunter and explorer living in a world filled with mechanical beasts. With her bow and a quiver-full of advance technology, she’s embarking on a journey to unravel the mysteries of the world and why humanity has been reduced to a tribal existence. Now that sounds like a quest goddamn worthy of song and the gameplay trailer shown during Sony’s E3 press conference is certainly makes buying a PS4 tempting. I’m also becoming a huge fan of post-apocalyptic fantasy and science fiction literature, so this will certainly scratch that itch while remaining in its video game medium. The only problem I can see with the game is that it might devolve into fetch quests when you’re outside of scripted events as seen in the trailer. I like open-world games as much as the next person, but we’ll all be having more than enough of them with games like Fallout 4 on the way. 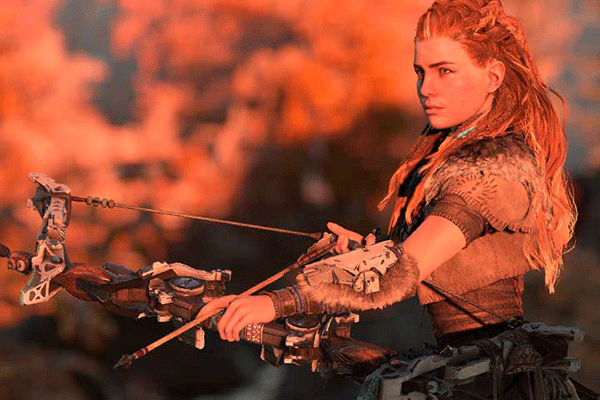 Here’s hoping the game has a great story to keep us moving through the wilderness instead of dragging us through fetch and hunting quests in order to upgrade Aloy’s bow. However, with the right amount of depth, the right amount of customization, and properly paced story, Horizon: Zero Dawn could be one of the big hits on the PlayStation 4. Aloy, from what we’ve seen of her, is also a stirring character at once being a determined hunter, but also taking the time to apologize for killing one of the robots she hunts. I want to… no I need to know more about this game and I’ll be keeping an eye out for it. ReCore’s world is a mystery, but my tears won’t be if the companion doesn’t make it through the game. I wonder if video game developers – because of their proximity to various forms of technology – are more susceptible to catching the brainwaves of other developers. 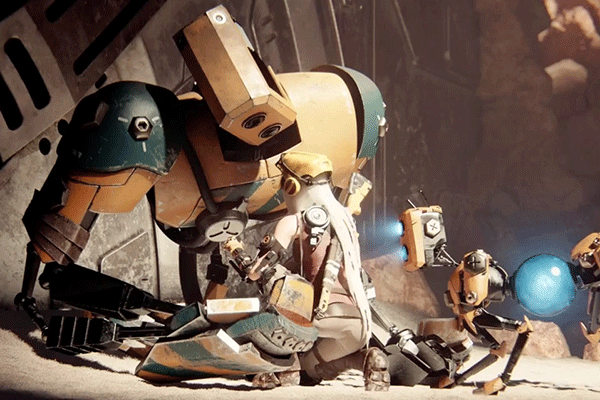 Whether or not ReCore influenced Horizon: Zero Dawn, or vice versa, the two games are both feature large, science fiction inspired, robot-filled open worlds, but ReCore’s has a cute robot dog, so it automatically wins. In the game’s trailer, we watch as the game’s lead and her robot dog investigate a small ruin. While there they discover a large robot, but they soon come under attack. Soon enough, the dog has sacrificed its body to destroy the attackers and the woman picks up its blue core. She puts the swirling orb of energy into the larger robot and it comes to life. A combination of Alyx and Dog from Half-Life 2 and Peter Chung’s Matriculated from the Animatrix, ReCore’s protagonist and her companion seem to have a symbiotic relationship. She can’t survive without the robot and the robot can’t survive without her. And as we see as the end of the trailer, it looks the robot will be acting as a kind of monkey wrench able to switch shapes depending on the situation at hand. The world around them also seems to have gone through a major disaster that’s essentially left the machines in charge. Maybe something’s gone wrong with their artificial intelligence or maybe the robots were the ones who perpetuated the disaster, but it’s up to us to find out what happened. I’m pretty excited by these two games as a fan of post-apocalyptic fantasy and as a video game player. I am also happy that they’re giving a voice to female protagonists and I’m confident that they won’t be defined just by their gender. I’ve also read a number of science fiction and fantasy books this year that have included strong female protagonists, so the movement to include more women in fiction, it seems, isn’t just limited to video games. This entry was posted in Gaming and tagged E3 2015, female protagonists, Horizon: Zero Dawn, ReCore, video games. Bookmark the permalink.